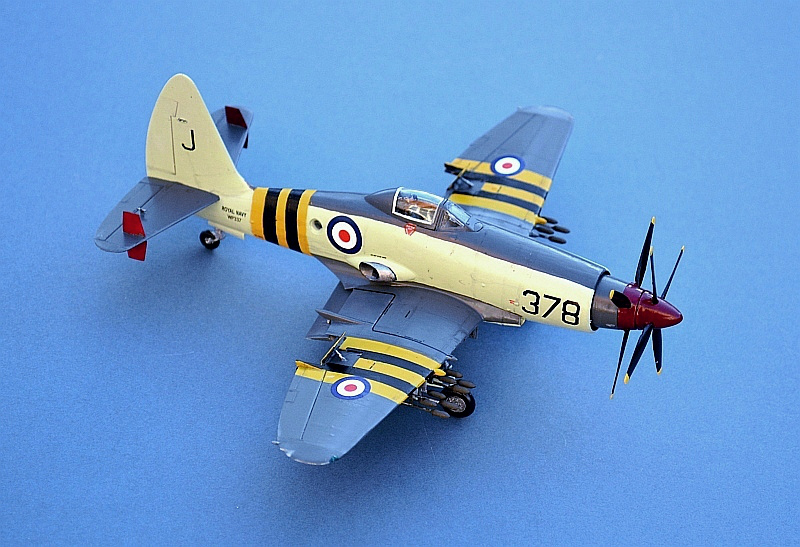 De Havilland Sea Hornet F.20, 801 Sqn Fleet Air Arm, HMS IMPLACABLE, 1950. Frog's kit of the DH Hornet, in this case an early Novo issue, is another excellent example of late Frog quality. Certainly, it is basic, but it fits together well (even in this Novo incarnation) and is reasonably accurate. The very few panel lines are raised and perhaps a little heavy, whilst comparison with a set of basic drawings suggests that the nose may be a little too short, but overall the kit captures the shape of this now extinct aircraft well enough. 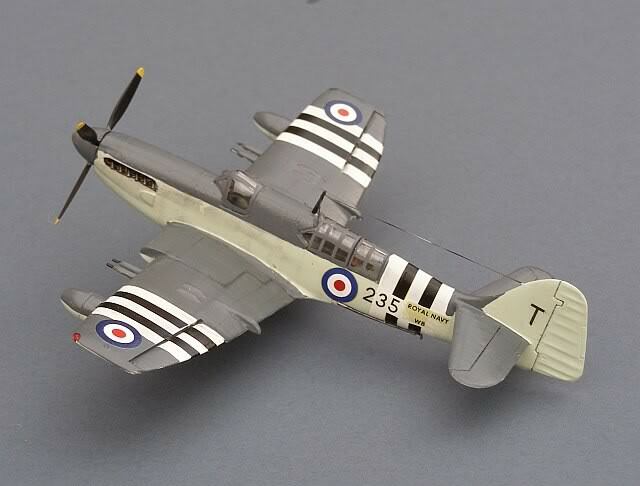 This is a simple conversion into a Sea Hornet, by adding wing fold lines, a hook and my own decals. 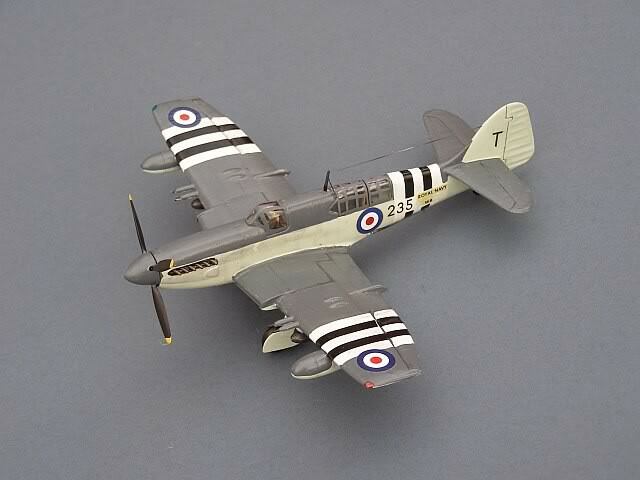 As the tide began to turn in the WW2 Pacific Campaign, British aircraft manufacturers turned their efforts to designs that would be well suited to the vast distances of the Pacific. 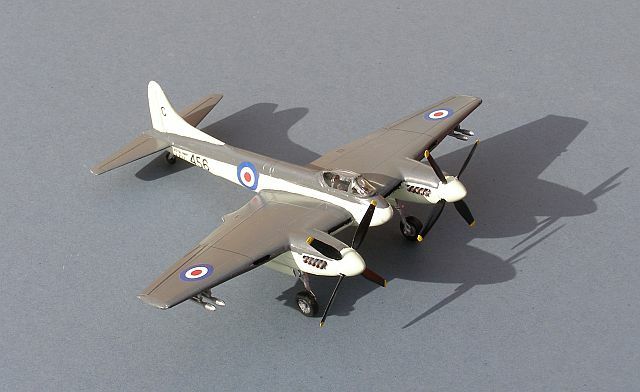 DeHavilland's contribution was one of the fastest propeller driven aircraft ever built, the elegant DH.103 Hornet, developed from the famous wooden wonder Mosquito. 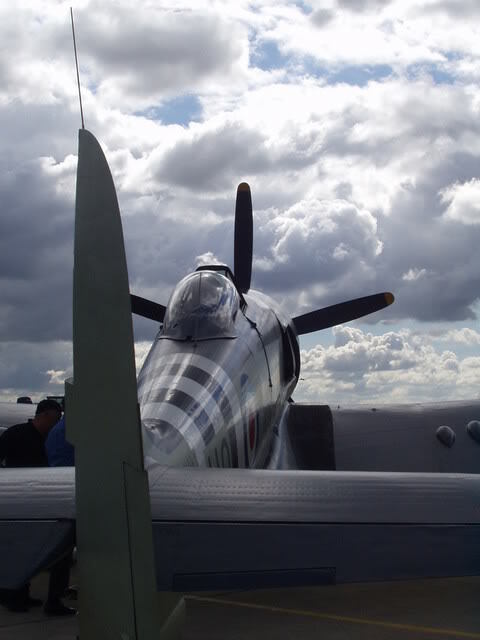 Smaller, but with the same Rolls Royce Merlin power, now in even more streamlined engine nacelles, and the same lightweight wooden construction, the Hornet was remarkably fast, with an astonishing power to weight ratio and possessed a tremendous operating range (nearly 2000 miles with drop tanks fitted). Indeed the Hornet was significantly faster than the contemporary jet powered Gloster Meteor, achieving a top speed of 472mph at 22,00ft against the Meteor's 415 mph. 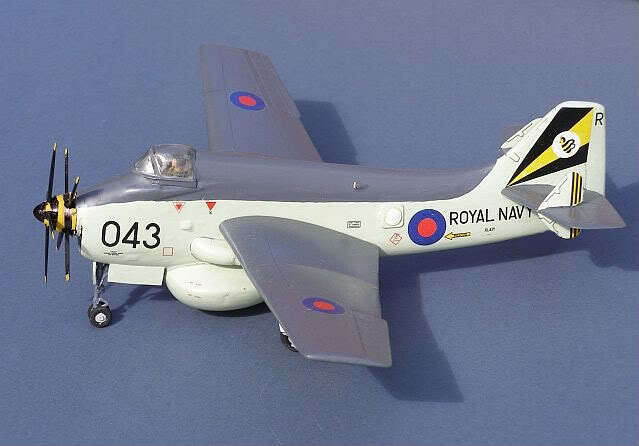 The Sea Hornet was a simple conversion to add a hook, catapult spools, revised hydraulic undercarriage oleos and naval radio equipment. 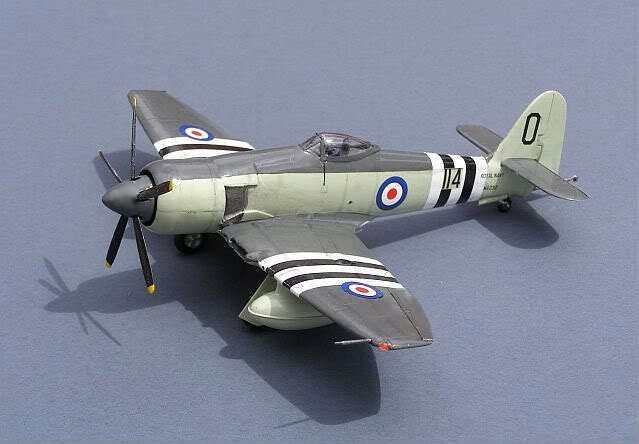 Sea Hornet F.20s served for a relatively short time with only one first line squadron (801 Sqn from 1947 until 1951), but remained in significant numbers with second line units until 1955. A twin seat, radar equipped night fighter, the NF.22, was also produced, serving again with only one front line unit, in this case 809 Sqn. Fairey Firefly V 810 Sqn Fleet Air Arm, HMS THESEUS, Korea 1950. 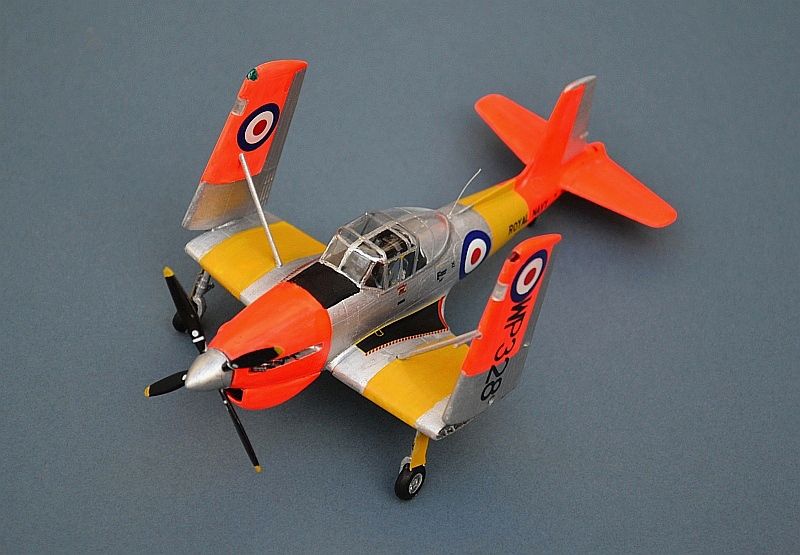 The Airfix Firefly is nicely detailed for its time, and a straightforward build, with a very nice wing-fold option. 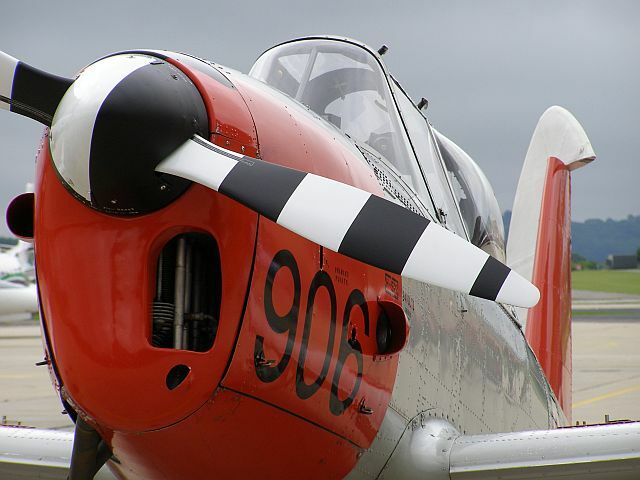 The Rolls Royce Griffon-powered Firefly continued the FAA policy of large 2-seat Fighter-Reconnaisance aircraft, started with the Hawker Osprey. Built to replace the Fulmar, it was a far better aircraft, particularly well suited to open sea and long range missions. 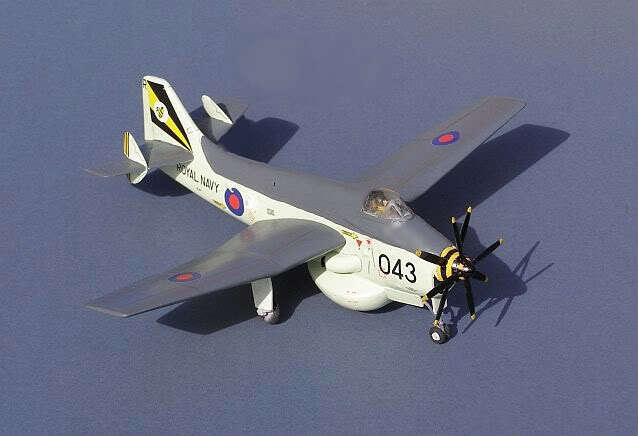 By the start of the Korean War, the Royal Navy was mainly using the later Mk.V variant, with its clipped wings and wing-root radiators. Fireflies were particularly active over Korea, providing close support to Korean and UN ground forces. HMS THESEUS arrived in Korean waters in October 1950 to relieve HMS TRIUMPH, with her Sea Furies and Fireflies conducting intensive strikes on North Korean bridges and vehicles. THESEUS' Ship's Company were confident that their Korean War mission would end soon and that and they would be on their way home, hopefully via an Christmas stand-off in an exotic far-east port (Hong Kong was the favourite). But with massive Chinese intervention in the war, UN forces were again being pushed south so after a very brief New year rest in Japan, THESEUS and her aircraft were back in action, operating from the Yellow Sea as the bitter Korean winter set in. Twelve of THESEUS aircraft were lost to a combination of ground fire, air to air combat and accidents during this period of combat, which was to last another full year. THESEUS finally left Korean waters to return to Rosyth for refit in January 1952. 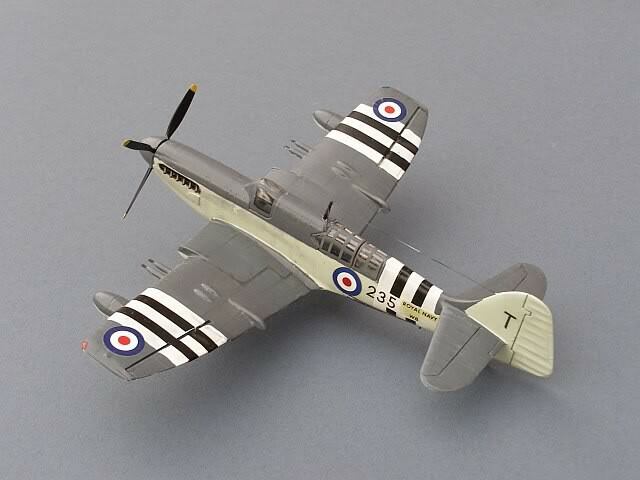 Hawker Sea Fury FB.11, 802 Sqn HMS OCEAN, Korea 1952. 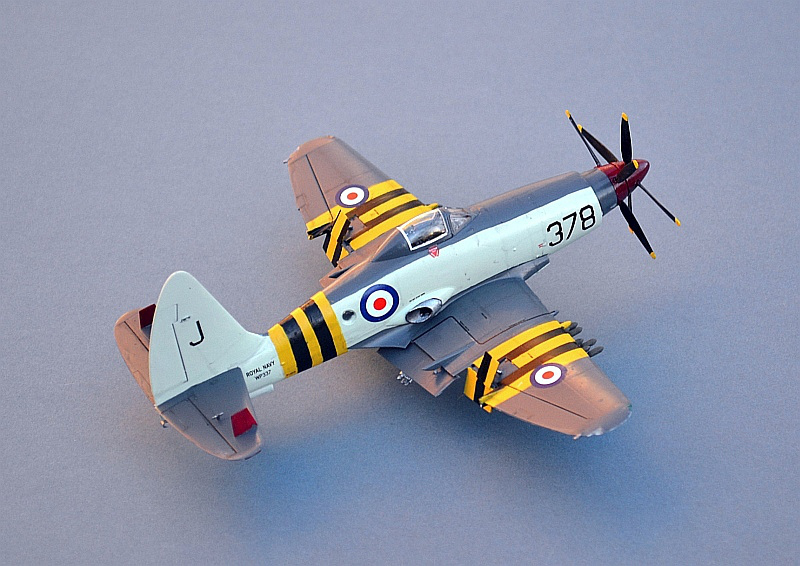 Trumpeter's Sea Fury is a huge step forward from the ancient Frog offering and a big step on from the reasonable PM version. However, it is certainly not "Shake & Make" with a number of fit and detail issues to be resolved. Painting that high demarcation line on the fuselage is very frustrating; I had just got it right when the masking tape took off all the sky paint - aaargh! 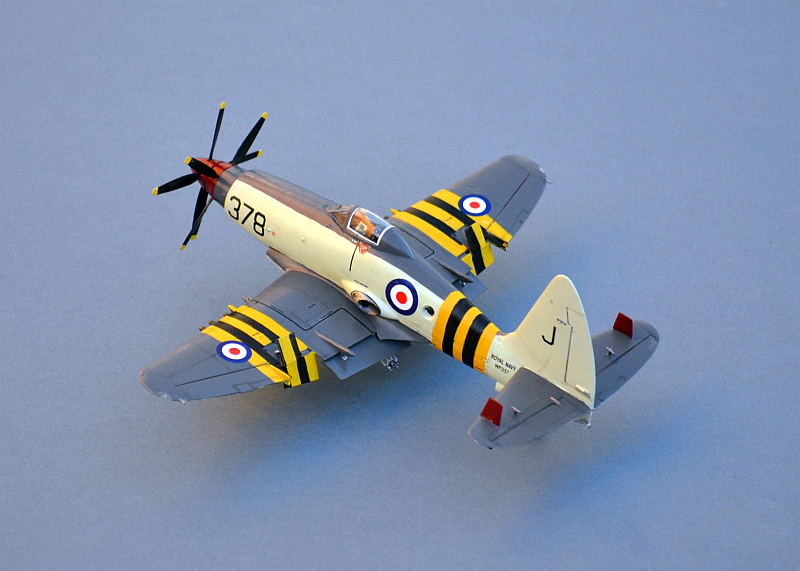 Many people consider Sir Sidney Camm's Sea Fury to be THE ultimate piston engine fighter. 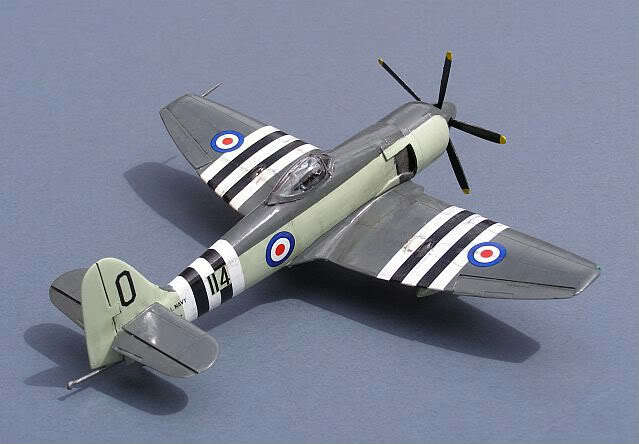 Conceived during the final years of WW2, it was a typical Hawker design; robust, well thought out and highly capable. 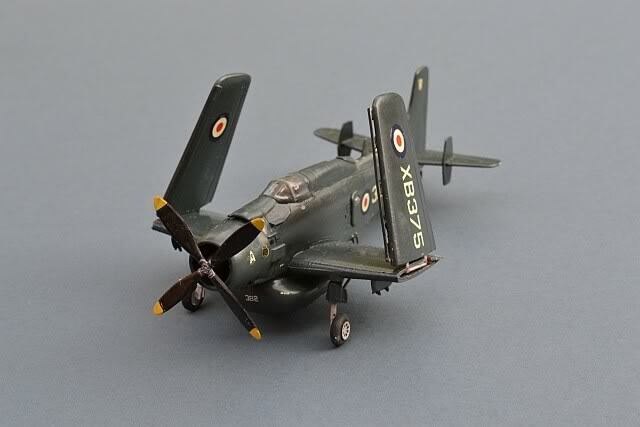 When it entered service in 1947, the utility of jet aircraft at sea was yet to reach a satisfactory level, but it was clear that the Sea Fury's days would be limited. Nevertheless, its six years of front line service co-incided with the Korean War, where Sea Furys, operating from HM Ships GLORY, OCEAN, THESEUS and HMAS SYDNEY, proved highly effective in the ground attack role. They also achieved a startling victory, when 4 aircraft of 802 Sqn, (Lts Carmichael & Davis, plus Sub Lts Haines & Ellis) shot down a Korean MiG 15 fighter that was attacking a mixed formation of Sea Furys and Fireflies. Note: It has been suggested that Lt Carmichael's aircraft had a blue spinner, to reflect his position as Blue Flight Leader. However, evidence for this is rather scant, it would be a unusual move and even if it was coloured, then there is no way of knowing what sort of blue this would be. I have therefore gone for the standard EDSG spinner as I think it more likely (e.g. faded EDSG can look decidedly blue). Hawker Sea Fury F.10, 799 Naval Air Squadron, RNAS Yeovilton 1948. 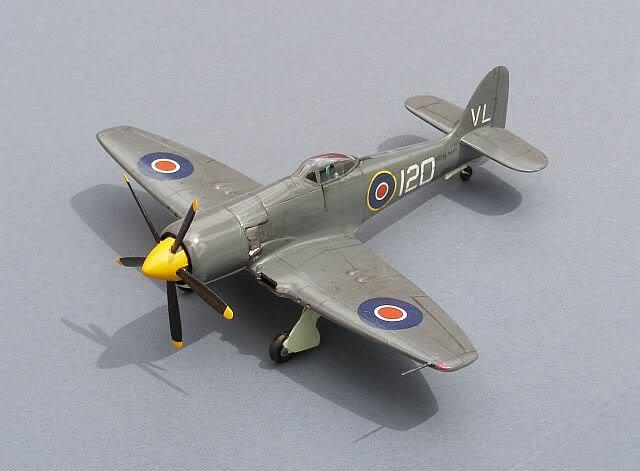 The PM Sea Fury is considerably cheaper than the Trumpeter, and a much easier build. This one is essentially out of the box, but with my own decals. 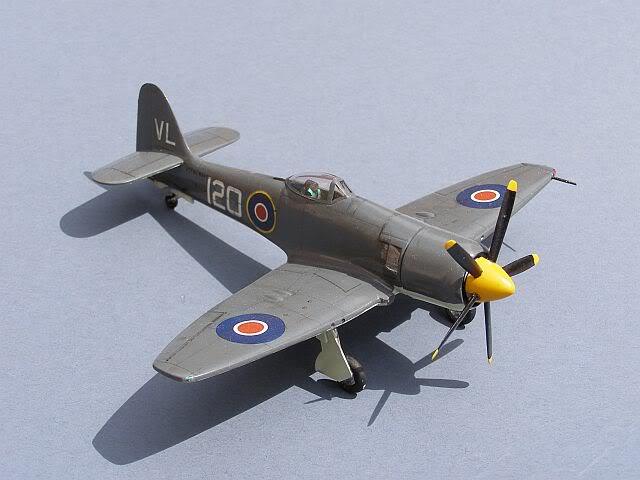 The original Sea Fury X / F.10 was intended as a pure fighter and lacked the underwing hard points for ground attack weaponry. However, its stretch potential was quickly realised and most F.10s were quickly converted to FB.11s. RN Historic Flight, RNAS Yeovilton 1976-1990. PM's 2-seat Sea Furies use the same wings etc, but a modified fuselage. The RN found that the high performance Sea Fury required a dedicated 2-seat trainer, so an extra cockpit was grafted on and equipped with a raised periscope gun sight reflector to allow the instructor to see the same view in the gun sights as his trainee. Only 2 guns were fitted, to allow relocation of equipment displaced by the second cockpit. 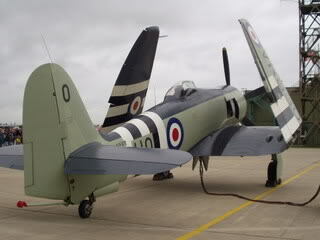 This particular aircraft was operated by the RN Historic Flight until it was written off in a crash in 1990. It has since been rebuilt by an American collector and is currently (2008) for sale. Supermarine Type 382 Seafang Mk.31, Carrier Trials Unit, HMS ILLUSTRIOUS, 1946. AZ 1/72 Spiteful modified. 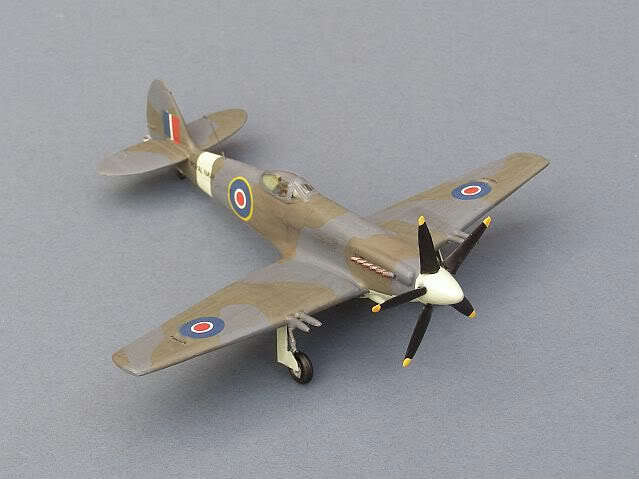 The planned main production variant of the Seafang would have been the Mk.32 with contrarotating props and folding wings, but to enable early entry into service, the initial Mk.31 was a basic version, essentially a Spiteful with a hook. 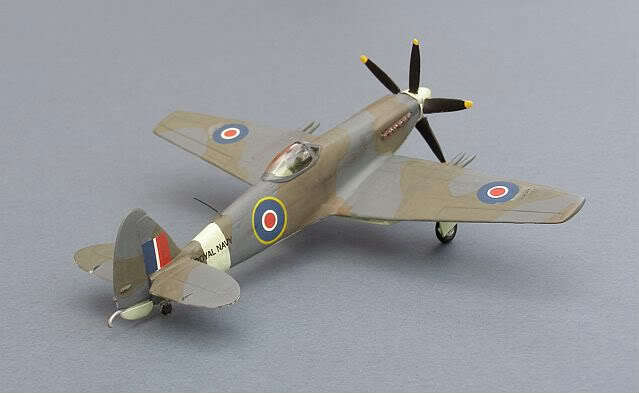 The Seafang and Spiteful were the last gasp of the Spitfire line. By 1943 it was evident that the Spitfire airframe had reached its physical limits, so Supermarine began work on an advanced wing to allow far higher speeds. The laminar flow wing was thinner, with a sharper leading edge and with its thickest part further aft. By allowing the air to flow around the wing with less turbulence, drag would be reduced and the top speed of the aircraft would increase. 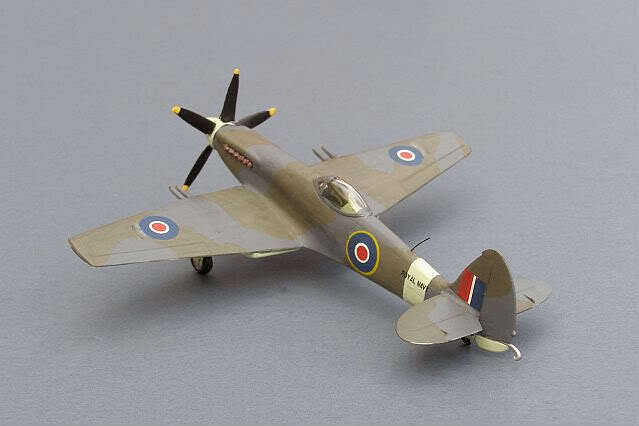 At the same time, the overall shape and construction of the wing were simplified, overcoming a long lasting production limitation of Mitchell's original Spitfire wing design. A new fuselage was also designed, with a lower nose overcoming the visibility issues that the longer Griffon engine had brought, whilst a larger tail unit restored the longitudinal stability lost with the more powerful engine and the bubble-top after deck. The Spiteful and Seafang were modestly successful and were certainly very fast, although the new wing showed some undesirable characteristics when approaching a stall. 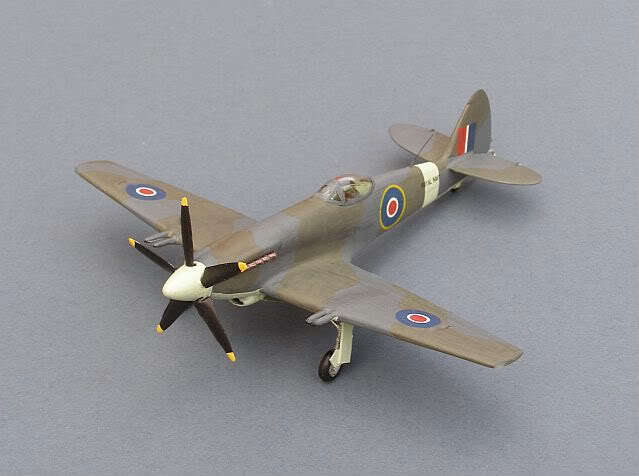 None of these were significant issues for such a radical design and could have been overcome in time, but the end of the war, the emergence of jet technology, plus the success of the rival Hawker Fury/Sea Fury and Seafire 45/47 designs, meant that further development of the aircraft was halted after only 19 had been built. Nevertheless, the advanced laminar flow Spiteful wing did eventually see active service, evolving into the awkward looking Supermarine Attacker, the Royal Navy's first operational jet fighter. Fairey Gannet AS.4, 815 Sqn HMS ARK ROYAL,1956. Another Frog classic. Until the recent Trumpeter (and imminent Revell) kits, this was the best you could get. Its not bad, although the cockpit is a flat deck with the pilot's heads moulded on. This one has been built entirely out the box with no changes. Despite being the subject of "super priority" production, Fairey's Gannet went through an extended gestation period before entering service. 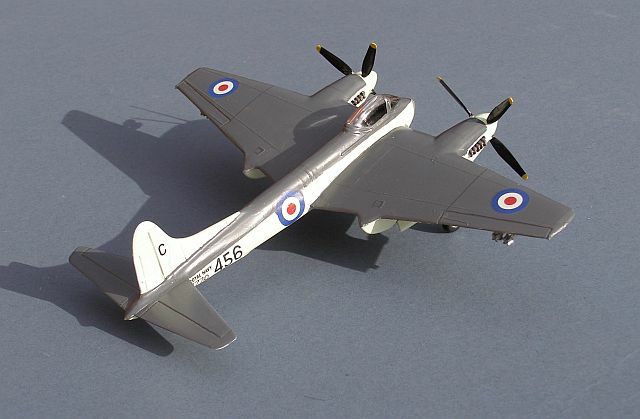 Powered by the revolutionary Armstrong Siddeley Double Mamba turboprop engine, the Gannet was the ultimate evolution of the propeller driven, carrier based ASW aircraft. 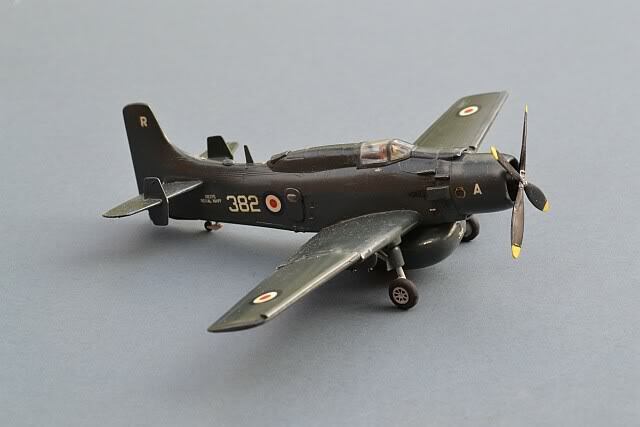 Douglas Skyraider AEW1. 849 NAS A Flight, HMS ARK ROYAL. 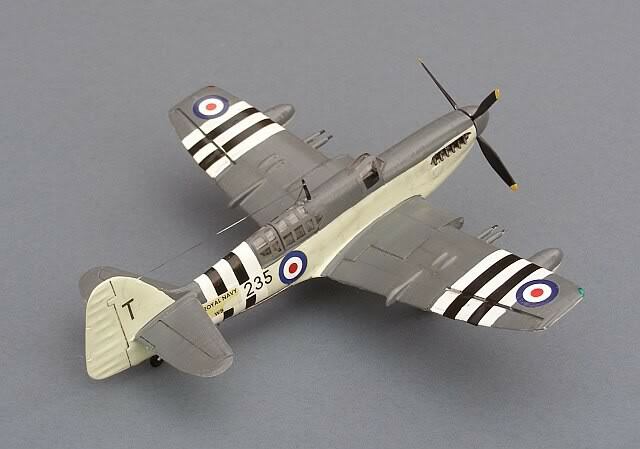 This is the Airfix kit with the C-Scale white metal and acetate vacform conversion, plus my own decals. 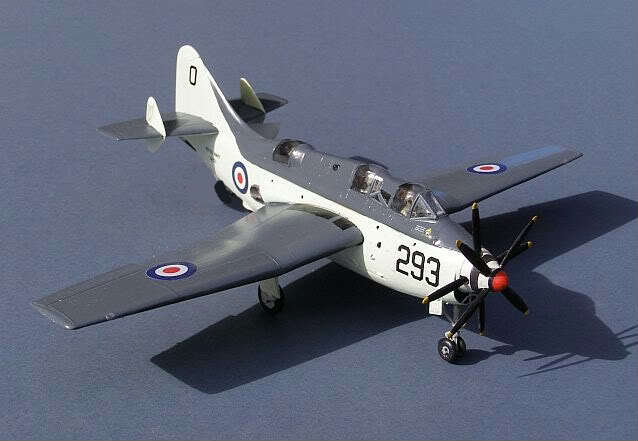 For the RN, the Skyraider AEW conversion was a stop-gap measure until the Gannet AEW3 was available. In typical cheapskate style, the radars were eventually transferred from the Skyraiders to the Gannets. Some of them even ended up in Shackletons, providing front line defence of the UK until the late 1980s. Fairey Gannet AEW.3, 849 Sqn B Flight, HMS ARK ROYAL,1978. This is the ID Models vacform fuselage added to the Frog kit. Decals from Model Alliance. 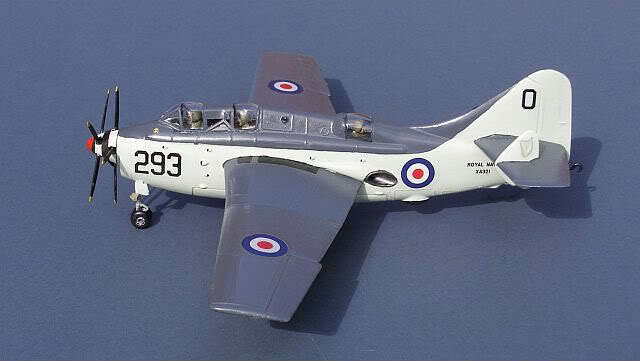 The Gannet airframe was radically redesigned to carry an AEW Radar set. 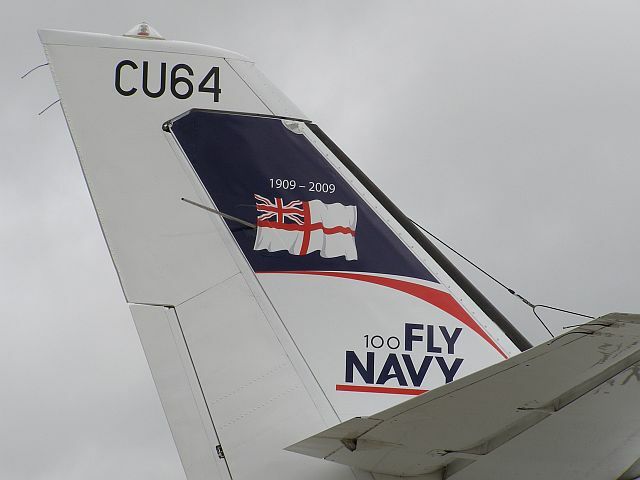 In this form it served on RN Carriers until the late 1970s, ending its days as a shore based aircraft in support of the RAF's ancient Shackleton AEW aircraft. The Gannet's organic OTH (over the horizon) radar capability was sorely missed in the South Atlantic in 1982. 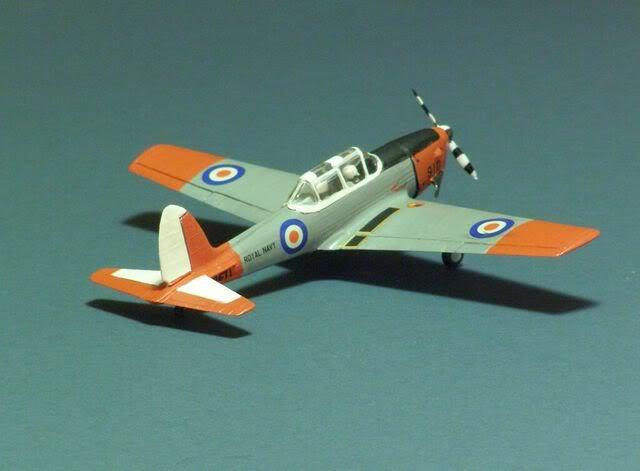 DeHavilland Canada (DHC) Chipmunk T.10, Royal Navy Grading Flight, Roborough Airport, Plymouth 1983. 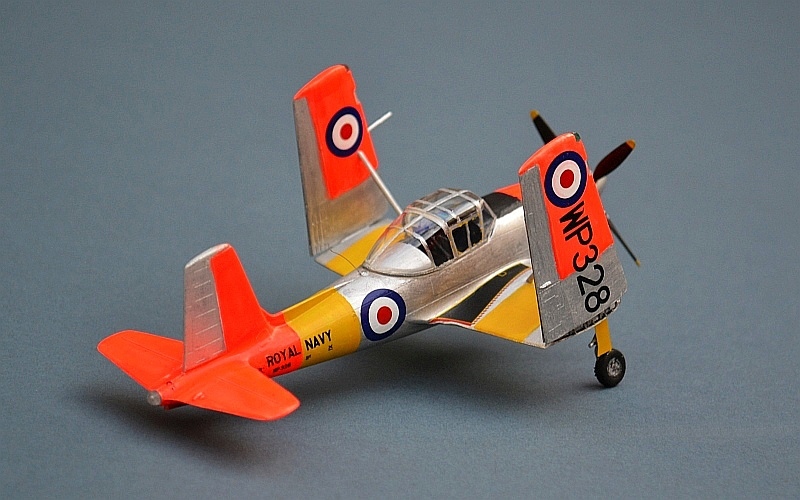 So far as I know, the Airfix Chipmunk is the only kit of this versatile and long lived trainer. 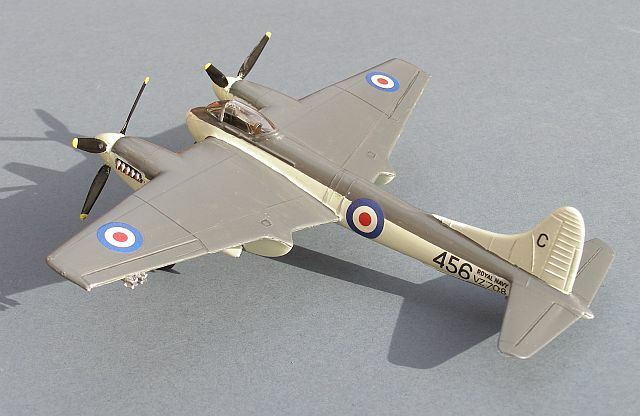 It is very basic, with prominent rivets, flimsy undercarriage and a somewhat difficult wing to fuselage join. Decals are from the original kit and my spares box. The kit is otherwise OOB, except that I substituted the early leather helmeted aircrew for some later ones with modern bone domes and added the anti-spin strakes in front of the tailplanes. This type of aircraft, from the Fleet Air Arm's initial training and grading flight, has the distinction of being the only aeroplane that I have actually flown (as opposed to flown in) . During my one and only flight, we passed up over Dartmoor, around the Princetown TV Transmitter Mast, then up to the North Devon coast for a couple of loop the loops and barrel rolls, then back south (with the canopy cracked open for some fresh air as I was, by this time, feeling distinctly nauseous) around Torbay then back to Roborough. I managed to get back on to the ground with the engine stopped before actually being sick! The Chipmunk was the first indigenous Canadian aircraft design. Entering service in the early 1950s as a replacement for the Tiger Moth, it continued in UK military service until the late 1990s. During the 1960s, the Fleet Air Arm acquired twelve ex-RAF aircraft for initial training and grading of potential naval aircrew, operating the Britannia Flight aircraft from Roborough Airport at Plymouth (latterly under contract to Airwork Services). 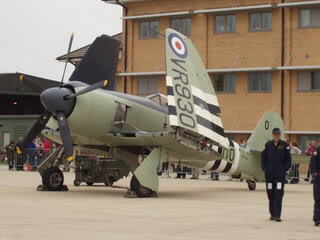 And the real thing at Yeovilton in 2009. Handley Page/Scottish Aviation/British Aerospace Jetstream T.2, 750 Sqn RNAS Yeovilton 1986. 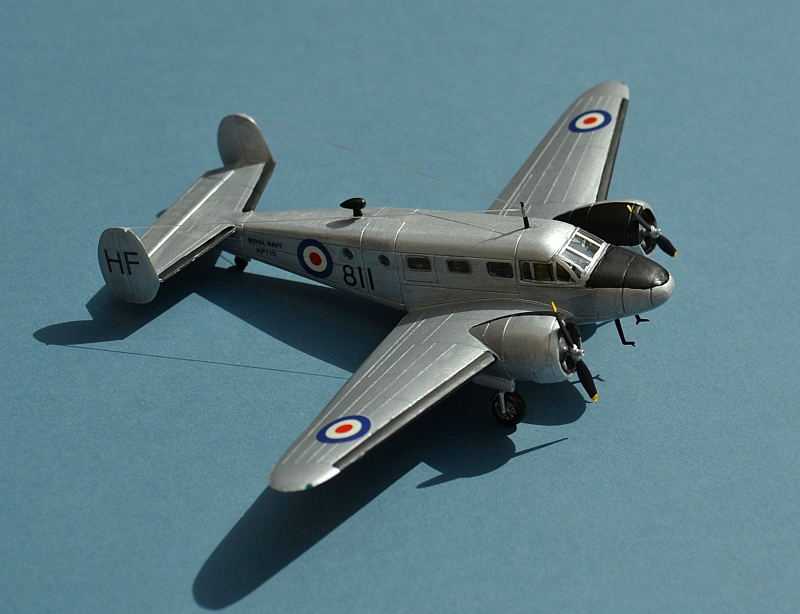 The M&E Models conversion from the Airfix Jetstream has excellent decals, but is otherwise quite simple, matching the kit itself. It includes the new nose, replacement engines and some rather nice transfers for both RN & RAF T.1 variants. I built this kit back in the mid 1990s, when I had effectively given up modelling for a while. As a result it is not one of my better efforts. 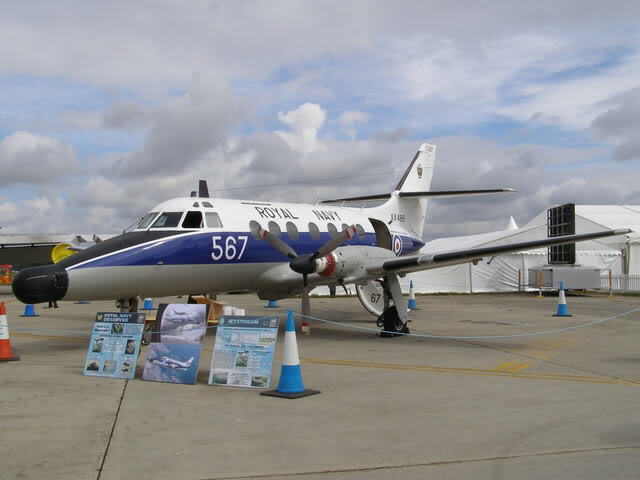 The Jetstream was one of Handley Page's last independent designs. Subsequently built by Scottish Aviation (a British Aerospace subsidiary) at Prestwick, it had reasonable success as a regional "feeder" airliner in the US. 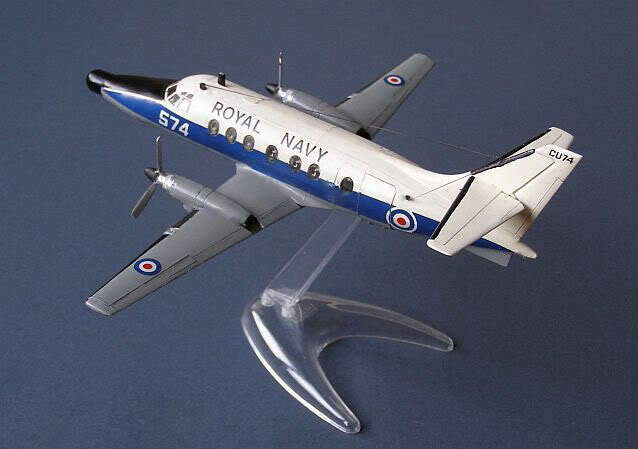 Royal Navy Jetstream T.2s replaced the Sea Prince for training Fleet Air Arm Observers, as well as general communication duties; the main difference from the civil (and RAF) version is the use of the Turbomeca Astazou XVI turboprop, plus a distinctive Ekco navigation radar dome in the nose. Beech C-45 Expeditor II, 728 Sqn RNAS Hal Far, Malta, 1951. PM models have a very mixed reputation, ranging from OK to very poor. 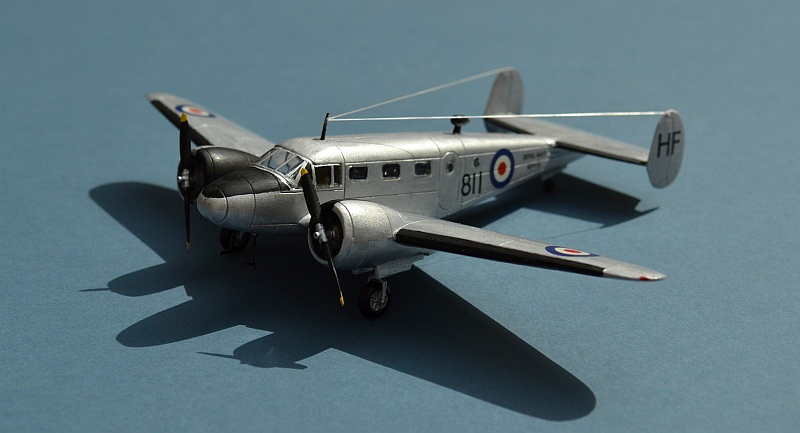 Their C-45 and AT-11 kits are at the better end of the spectrum, with reasonable shape and fit. 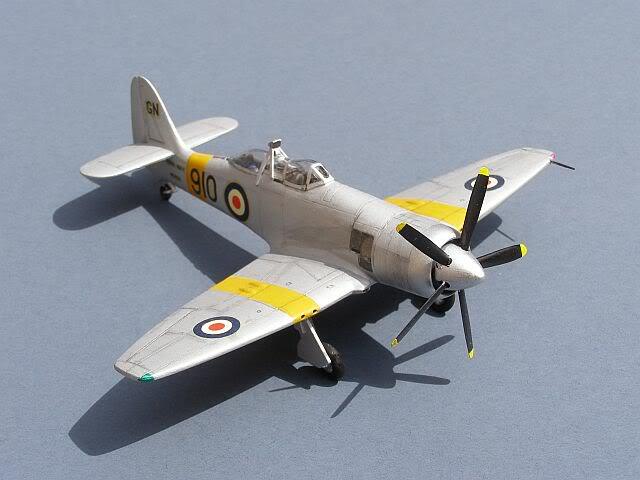 As supplied, the kit can be built as an US Navy example, or an RAF version from India Command in 1942. This one has a set of home-made (inkjet printed) decals for an RN version. The Beech Model 18 saw widespread military and civilian use as a light communications transport and trainer. It remained in production from the late 1930s until 1970, holding the record for the longest continuous production of a piston engined aircraft. 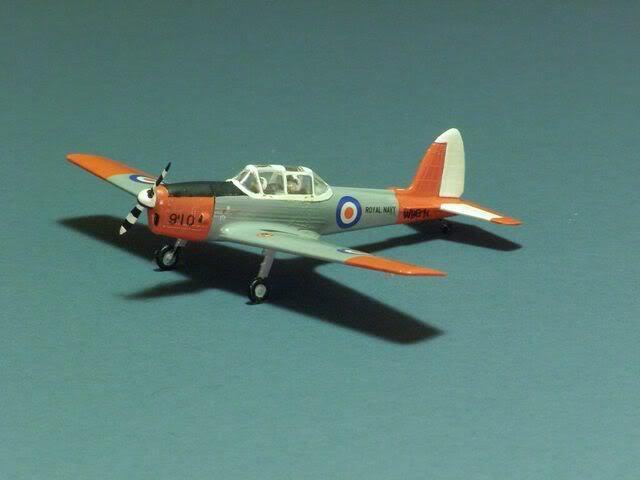 Boulton Paul Sea Balliol T.21, MTP School RNAS Abbotsinch, 1963. 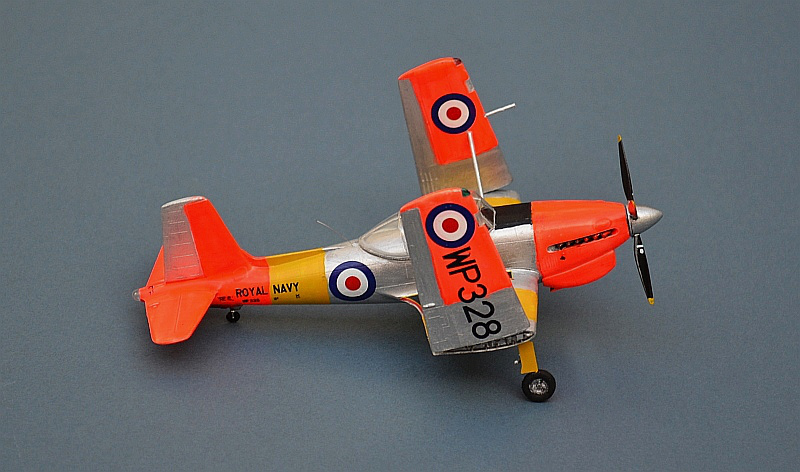 Special Hobby kits are some of the best low production moulds around and whilst this one has a few building foibles, it builds into a colourful and interesting representation of the RN’s lfinal pre-jet age trainer. 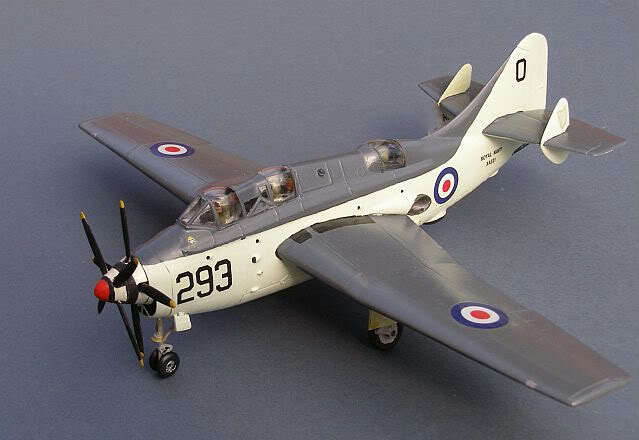 The Balliol served as an advanced trainer with the RAF and RN (with folding wings and hook) during the mid 1950s with the last example remaining in use until the mid 1960s. De Havilland DH.82a Tiger Moth, BRNC Air Experience Flight, Plymouth 1957. 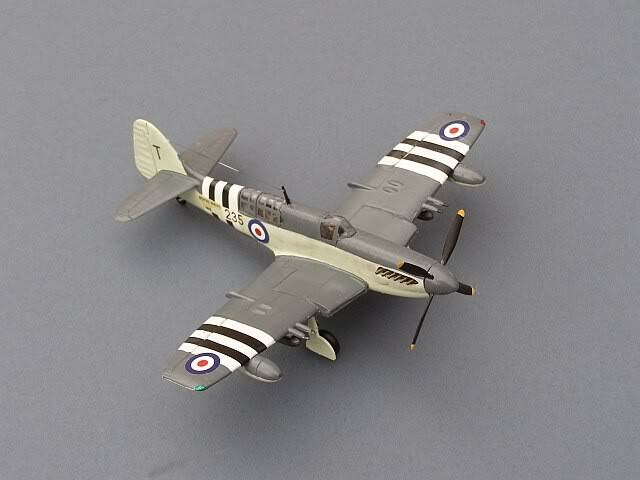 This is the recent Airfix kit , which is most impressive. Slightly delicate, so not the easiest of builds, but the results are very pleasing. As supplied, the kit comes in 3 variants; two RAF Trainers and a civil version; this one has some home sourced decals from the spares box. 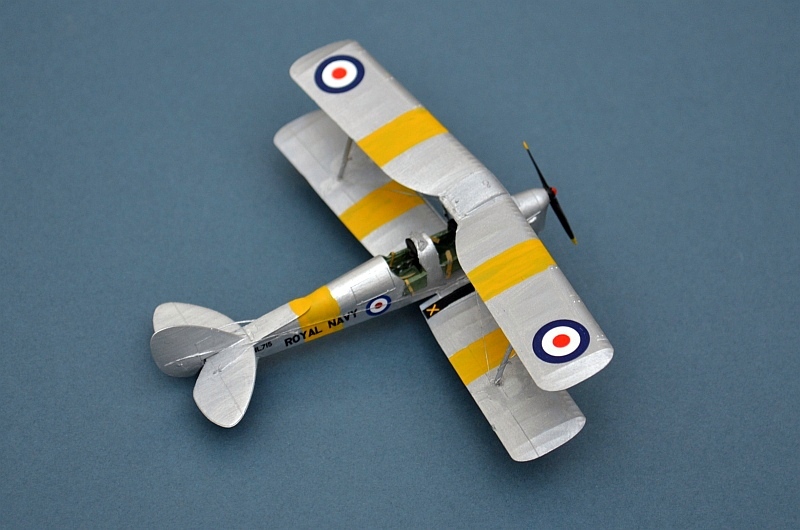 The Tiger Moth first flew in 1931 and was quickly established as a leading primary trainer across the world. Over 500 were in RAF service alone by the start of WW2 with an eventual production run of over 7,000, over 4,000 of which went to the RAF. Tiger Moths were built in the UK by DeHavilland, Morris and Scottish Aviation, in Canada by DHC, in Australia by DH Australia as well as in New Zealand, Sweden, Portugal and Norway. 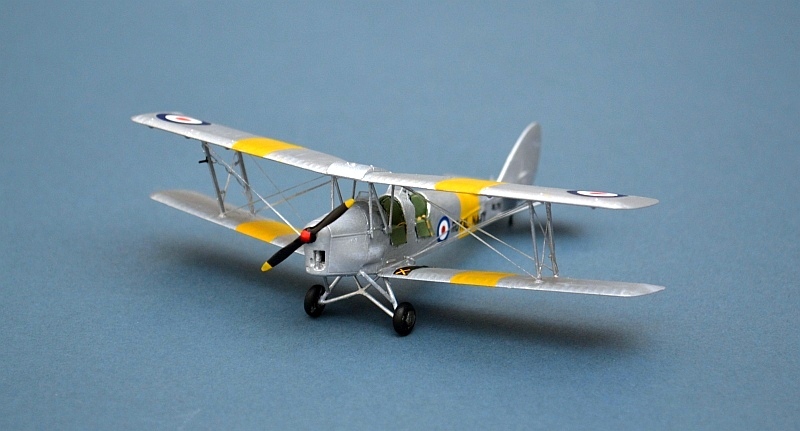 The Royal Navy used a small number of Tiger Moths as target tugs and "air experience" machines. With an additional batch of purchased a batch of refurbished ex civil examples purchased in 1956, one of which made the last biplane landing on an aircraft carrier (HMS Eagle)in 1967. Westland Wyvern S.4, 830 Sqn HMS EAGLE 1956. Trumpeter’s Wyvern kit is a modern and very polished production, accurate and easy to build with a good range of decal and weapons options. The Wyvern represented the last gasp of the Torpedo Fighter concept, straddling the era of propeller driven naval combat aircraft and the jet. It suffered a very long gestation period, largely due to delays in the development of suitable conventional powerplants, but eventually entered service using the Armstrong Siddeley Python turboprop. Wyverns only remained in service with the RN for 4 years, equipping 4 front-line squadrons. Nevertheless, 830 Squadron based in HMS EAGLE played a key role in the Suez landings, flying 79 intense and highly successful back to back sorties against Egyptian air bases, as well as flying close support to ground forces in the landing zones. Two Wyverns were lost to Egyptian anti-aircraft fire, but on both occasions the pilots were able to fly out over the sea before ejecting, allowing them to be picked up by EAGLE’s SAR helicopter. 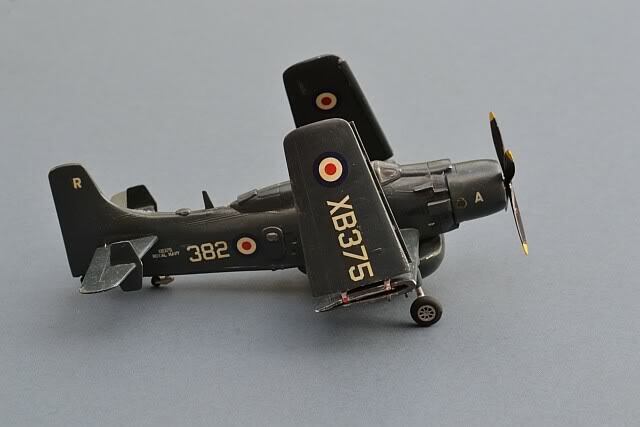 Although it proved a stable weapons platform with a commendable war record, of the 124 Wyverns built for the Fleet air Arm, with 39 were lost in accidents , with 13 fatalities. By 1958 it was obsolete and was quickly withdrawn from service. De Havilland DH104 Sea Devon C Mk.20, 718 Sqn RNAS Culdrose 1967. 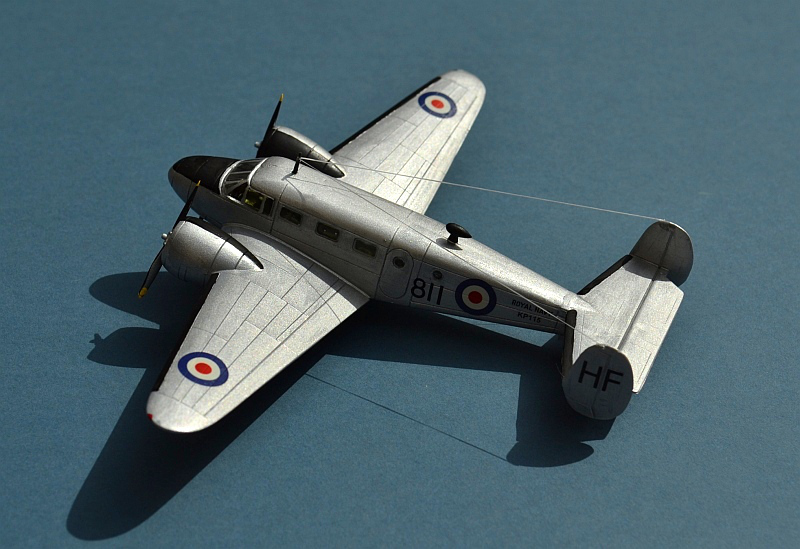 Amodel’s Sea Devon/Dove is an enchanting, but tricky build of this distinctive small transport aircraft. ThThe Sea Devon C Mk.20 was the Royal Navy’s version of the highly successful DeHavilland Dove short haul airliner, itself seen as a direct monoplane replacement for the iconic Dragon Rapide biplane (Dominie in RN and RAF service). Powered by two DH Gipsy Queen 70 motors of 340hp each, it was capable of over 200 mph with a range of up to 880miles at a more leisurely cruise speed of 187 mph. The Dove’s first flight was in 1945, and production ended in 1967 during which time, over 540 Doves, Devons and sea Devons were built, including a militarised version, known in the RAF as the Devon C Mk.1 and C Mk.2, of which over 127 were built for air forces around the globe as VIP and light transports. With all-metal construction, constant speed propellers, flaps and retracting tricycle undercarriage, the Dove was seen as an advanced design and it was able to carry up to 11 passengers in relative comfort . 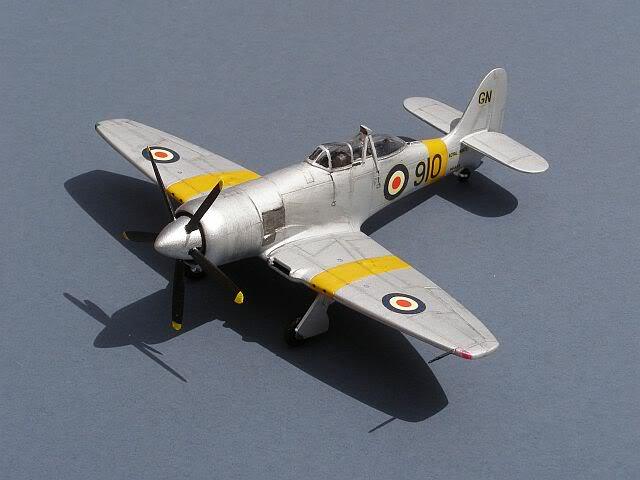 Maintainability was a key part of the design , with easily interchangeable airframe parts and quick release engine mounts. 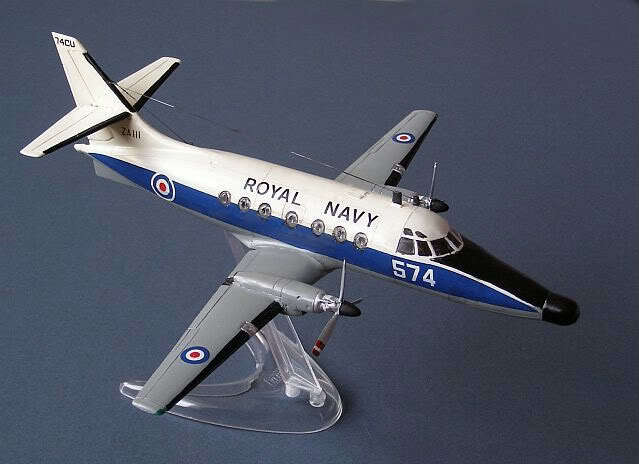 The thirteen Royal Naval Sea Devons were not part of the militarised batch, but were former civil aircraft purchased second-hand by the Fleet Air Arm and operated by 718 Naval Air Squadron out of RNAS Culdrose from 1955 until 1981. They served alongside five of the larger DH Sea Herons, a four engine development of the Dove.